[NOV. 12, 2001] "October 2001 was the third-wettest October on record in Illinois since 1895, with some severe weather and cooler temperatures than average. August to October also was the ninth-wettest three-month period, and May-October was the 17th-wettest six-month period," says state climatologist Jim Angel of the Illinois State Water Survey (http://www.sws.uiuc.edu), a division of the Illinois Department of Natural Resources. According to the division’s records, precipitation was well above average in October: 6.58 inches compared to an average of 2.78 inches. Monthly totals were highest at Paris (9.87 inches) and Olney (9.75 inches). Temperatures were 1.5 degrees cooler than the 55-degree average for October in Illinois. Brownstown reported the warmest reading, 87 degrees on Oct. 2, and Freeport reported the coldest reading, 13 degrees on Oct. 17. Thunderstorms in northwestern Illinois resulted in at least 22 reports of hail, ranging in size from 0.25 to 1.75 inches, on Oct. 23. More severe weather on Oct. 24 resulted in 43 reports of hail, 14 reports of wind damage and a confirmed tornado in Monticello, with no deaths or serious injuries reported. Long-term records show that only 1 percent to 2 percent of tornadoes in Illinois occur in October. "Cool, wet conditions in October were good for replenishing soil moisture but did slow down harvest operations and construction. November temperatures are typically much cooler, with average highs from the mid-40s (north) to the mid-50s (south) and average lows from the upper 20s (north) to the upper 30s (south). Average November precipitation ranges from 2.8 inches (north) to 4.4 inches (south). Heating degree days measure heating demand and range from 800 degree days (north) to 550 degree days (south). This month there’s also a high likelihood of seeing the season’s first measurable snowfall, with monthly averages ranging from 2.5 inches (northwest) to 0.5 inches (far south)," says Angel. [NOV. 12, 2001] The chart below is provided by John Fulton of the University of Illinois Extension. [NOV. 10, 2001] Logan County 4-H members Chris Ackerman and Andrew Fulton recently participated in the 4-H Missions in Space program at Huntsville, Ala. The program was for 4-H members in the seventh through ninth grade and took place at the U.S. Space and Rocket Center at Huntsville. Participants stayed in the Space Habitat complex and participated in astronaut training, a simulated shuttle mission, space station simulators, and took in the IMAX shuttle launch. The goal of the camp is to motivate young people toward greater achievements in math and science studies. The program also helps participants become aware of space agriculture and its current and future role in the exploration of space. [NOV. 1, 2001] Revised crop share and cash rent forms reflecting changes in law as well as current farming and management practices are now available through University of Illinois Extension. The new forms can be downloaded from Extension’s "farmdoc" website: http://www.farmdoc.uiuc.edu. After arriving at the home page, go to the Law and Taxation Section of the home page and scroll down to "Acquiring Farmland." There, click on "Lease Forms (Cash and Crop Share)." You will have the option of working online or downloading the forms. There are two formats available, an Adobe Acrobat version and a Microsoft Word version, so be careful which column you click in. The Acrobat version allows you to fill in the form and print it, while the Word version allows for saving typed alterations to the lease. For people who want to get paper copies of the lease forms, those are available from the Extension office. There are also diskettes available for purchase with both crop share and cash lease forms on them. This allows landlords and tenants to print multiple sets, save changes and make minor changes from farm to farm. Paper copy price remains at $1 for a set, and the diskettes are $5. Please feel free to contact the Extension office at 732-8289 for further information. 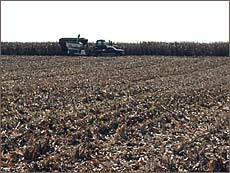 [OCT. 22, 2001] Harvest is winding down in the Logan County area. We can’t say it is rapidly winding down, due to the weather not being very cooperative. Estimates for harvest completed would be 95 percent for corn and 93 percent on soybeans. Yields have been better for later maturing crops, due to the timing of pollination and seed set and available moisture at critical times. There continue to be some wide swings in reported yields. Corn yields have ranged from around 90 bushels to over 200, with most recently harvested corn in the 160- to 180-bushel range. For soybeans, many of the fields being recently harvested are in the 50- to 65-bushel range. It seems like no matter how early we start harvest, Mother Nature doesn’t allow us to finish much before the last part of October or the first of November. One of the topics that is always talked about, but less often addressed, is farm leasing. Most of the talk centers on what cash rents are and modifications to the traditional 50-50 crop share lease. In the interest of focusing thoughts on leasing, following are some points from a recent newsletter put out by Dale Lattz from the University of Illinois. Central Illinois grain farms have about 14 percent of the land in the operation owned by the operator; 65 percent of the land is rented on a crop share basis; and 21 percent is rented on a cash lease basis. Cash rented ground has increased about 1 percent a year for the last five years at the expense of ground rented on shares. Many landlords and tenants are currently reviewing their lease situations. There are advantages and disadvantages to any leasing arrangement. From the landlord’s perspective, there can be significant impacts on how income is treated for self-employment tax and how ground values are calculated for estate tax (if something happens to you). Before making any changes, you should contact your tax planner or attorney. The other thing that is considered at this time of year is the amount of cash rent to charge. I don’t know if there is such a thing as a "fair" lease, but we should strive to have an equitable lease. There is also no such thing as an "average" cash rent. The range of cash rents in the county has over a $100-per-acre spread. Each rental arrangement should be negotiated between parties to fit their particular situation. One of the benchmarks to use in determining if cash rents should be increasing or decreasing is equivalent cash rents. This is the payment a landowner would have received under a traditional crop share arrangement. The 10-year average for northern and central Illinois on high productivity soils is $138.04. This includes $33.03 in landowner expenses, which would mainly be real estate taxes. The other main point to consider in establishing cash rental arrangements is the government program payments. These payments are shared according to risk. In a traditional 50-50 crop share arrangement, this would be 50 percent to the landowner and 50 percent to the tenant. In a cash rent situation, the tenant would get 100 percent of all payments. With a new farm bill being debated, the future levels of payments are uncertain. Good luck in establishing your rental arrangements. 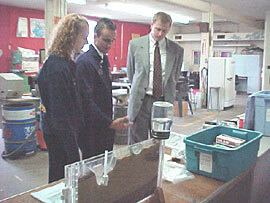 [OCT. 16, 2001] Rep. Jonathan Wright, R-Hartsburg, recently paid a visit to the Hartsburg-Emden Agriculture Department. FFA members Natalie Coers and Kent Leesman, along with agriculture teacher Betsy Pech, took time to explain the agriculture education program, not only at Hartsburg-Emden but statewide as well. The students informed Rep. Wright that Illinois agriculture education has a line item in the Illinois State Board of Education budget, which assists in funding high school agriculture programs. This money also is used to develop new curriculums, as well as developing agriculture literacy kits for elementary students. Kent and Natalie gave Rep. Wright a tour of the agriculture facilities, and he was able to see equipment, agri-science kits and other supplemental supplies that the Hartsburg-Emden agriculture program has purchased with the money appropriated by the Illinois Legislature. [OCT. 9, 2001] Logan County Farm Service Agency is currently searching for individuals representative of the county farmers to serve as nominees for the county committee election, which this year is in the district made up of Orvil, Prairie Creek, Broadwell, West Lincoln, Corwin and Sheridan townships, according to FSA County Executive Director Mark Fricke. The Logan County FSA administers federal agricultural production, farm loan, conservation and emergency programs annually in Logan County. A locally elected committee of farmers and landowners that serve staggered, three-year terms oversees operation of the county office. "It is critical to FSA’s future that we ensure that all farmers have an equal opportunity to be a candidate to serve as a member on our county committees," said Fricke. "Employees in the county office will be taking an active role in contacting producers and farm groups, along with leaders of minority, female and under-represented groups, to ensure that they fully understand the role of the county committee." Individuals of legal voting age with an interest in farmland as an owner, operator, tenant or sharecropper or those who are eligible to participate in any FSA program are eligible to vote in the election and are eligible to serve on the committee if nominated and elected. Spouses are also eligible to vote and serve on the committee if nominated and elected. "The locally elected committees shoulder primary responsibility for making national farm programs fit the needs and situations faced by local farmers," Fricke said. "They bring local expertise and knowledge to USDA’s daily delivery of programs and services." Fricke reminded farmers that for a nomination petition to be valid, it must be limited to one nominee, must include written certification that the nominee is willing to serve if elected and must be signed by one eligible voter in the area holding the election this year. Eligible voters may circulate or sign nomination petitions for as many candidates as they choose. The deadline to return valid nomination petitions to the local FSA office is Oct. 29. Minority and female farmers are encouraged to take part in this important nomination process. For more information, contact the local FSA office or USDA service centers. [OCT. 6, 2001] With fall definitely in the air, many of nature’s own are trying to find shelter for the winter. This group would include crickets, ants, spiders, ladybugs and elm leaf beetles. They are really seeking warmth, and they don’t care if they are on a rock in the sun or in your basement. Once in the home, you must decide whether to use pesticides, the vacuum cleaner or tolerate them. You can save yourself a great deal of worry over the welfare of children and pets by choosing a non-chemical course of action (the vacuum or tolerance). Another option that keeps pesticides out of the house is to spray a barrier of diazinon on the outside foundation of the house. Foundation sprays can be reduced to following a five-step program to have good success. 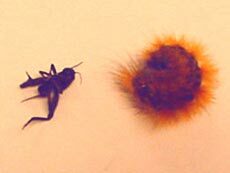 Some of the insects and their relatives that can be controlled or reduced would include ants, centipedes, cockroaches, spiders and earwigs. In addition to trying for warmth, some of these are just naturally hanging around in flower beds and lawns outside the house. Step one is to purchase an emulsifiable concentrate of diazinon (liquid form). Dilute with water to make a .5 percent solution for a foundation spray. The average home requires about three gallons of spray solution, so you will need about eight ounces of 25 percent diazinon concentrate in three gallons of water to get the correct percentage. Step two is to spray the foundation of the house just to the point of runoff. Spray all the way around the house. Also make sure to spray around the base of door openings. Step three is to also spray a 10- to 12-inch band of the solution on the adjacent soil. A wider band may give better protection but also has the extra insecticide involved. A wider band may be helpful if there is a flower bed or shrubbery providing for more insects close to the house. Step four is to spray behind concrete steps and other structures that join up with the foundation. If you can’t spray behind them, spray over and around them. Step five is to spray cracks and crevices in the foundation and in concrete slabs (such as driveways) that join the foundation. The idea is to crate a continuous barrier that insects, spiders, millipedes and other pests have to crawl through to get into your house. Even if they do get in, they won’t last long. Once insects are in the home, you shouldn’t use anything other than aerosol products that are labeled for use in the home. Many of the products just kill things that they come in contact with. A few do have a lasting residual. Remember that the more residual pesticides have, the more chances for accidentally causing poisoning problems. Any time that you are dealing with pesticides, you should read the label. The label is a legal document that should tell what it controls, how to mix, how to apply, safety precautions and other important information. Good luck to you as we enter fall and try to keep those nuisance pests out of your home. [OCT. 3, 2001] The 4-H centennial celebration will be in 2002. It’s not very often that we get to celebrate 100 years, so there will be several special events throughout the year. One of the main goals of the committee at this time is to identify past 4-H members living in the Logan County area. If you are a past 4-H member living in Logan County, please contact the Extension office for a past member involvement form, so that we may build a record of former members living in the area. The Centennial Committee is considering several activities in the coming year that would involve these former 4-H’ers. Please contact us by e-mail at logan_co@mail.aces.uiuc.edu, by paper mail at 980 N. Postville Drive, Lincoln, IL 62656 or by phone at (217) 732-8289. If you are one of the past 4-H members from Logan County who lives away from the area, we would also like to hear from you! [NOV. 6, 2001] Five members of the Hartsburg-Emden FFA land-use team took top honors in the recent Section 14 land-use contest. Natalie Coers was second-highest individual overall, Nic Coers was fourth-high and Kent Leesman was 10th-high individual. Josh Anderson and Nick Reinhart finished out the team. Objectives of this activity include determining soil conservation practices, slope, soil texture and structure characteristics, and whether the site is suitable for a home and septic field. 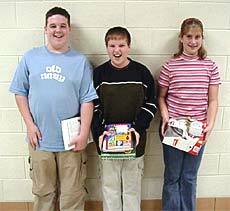 [NOV. 5, 2001] Logan County had its annual 4-H Achievement Night on Nov. 1 at the Lincoln Park District Rec Center. Approximately 150 4-H members, leaders and families came to congratulate the award recipients. 1. The "I Dare You" award is presented to 4-H’ers who have demonstrated qualities of leadership, excellence in character and effective future leadership. This year’s winners were Hans Bishop of Atlanta and Annie Davison of New Holland. 2. The 4-H Key Award is the highest award given. The qualifications are to be 16 years of age, have a minimum of three years of 4-H membership, submit a 4-H story and meet nine other requirements as verified by their leaders. Mary Healy of Middletown won this year. 3. 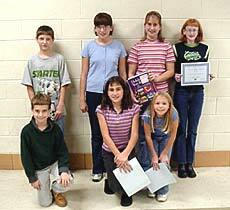 Some 4-H’ers are chosen each year in special award categories. A book is presented to a 4-H’er with outstanding work, quantity, quality, years, citizenship, leadership, participation, skill acquisition and growth. The books are given in three age categories: 8-11 years of age, 12-14 and 15-19. 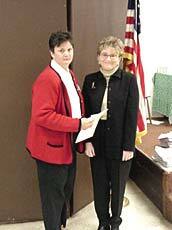 A Blue Award is given to a 4-H’er deserving of repeat recognition in a category. Winners are listed below by categories. For a complete listing of the 4-H awards presented on Nov. 1 or for information on the Logan County 4-H program, please contact the Logan County 4-H office at 980 N. Postville Drive, Lincoln, IL 62656 or call (217) 732-8289.